Adeptus Mechanicus, Imperial Knights, Astra Militarum and Thousand Sons: One Leman Russ tank left! 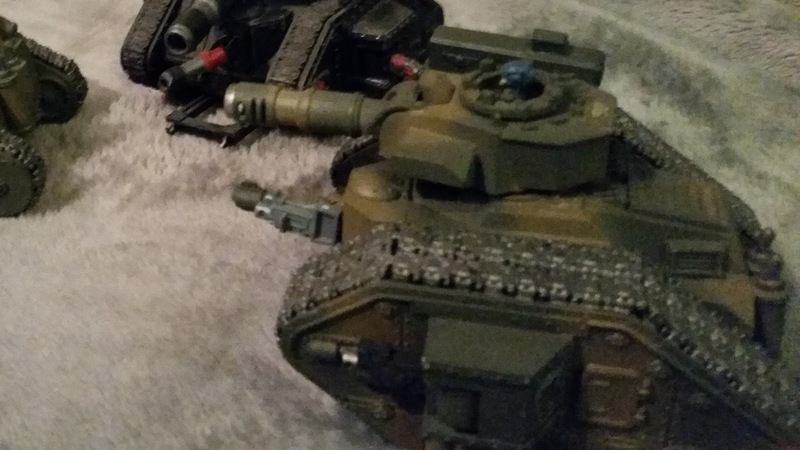 All right, I've sold 3 of the 4 Leman Russ tanks I've put up for sale! The single-tracked tanks have been taken. That leaves the double-tracked Leman Russ main battle tank with lascannon and heavy bolter sponsons. Well, if no one buys it, I'll eventually convert it into a Leman Russ Punisher with 3 heavy bolters (just gonna blue-tac the heavy bolter and Punisher cannon onto the existing cannons) or a Leman Russ Demolisher with multi-meltas. We'll see. 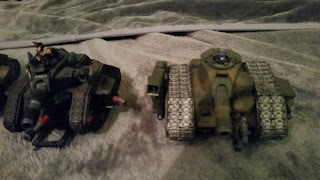 I have the spare bits from my Leman Russ Executiioner boxes, after all. But if there's anyone still interested in buying a double-tracked Leman Russ main battle tank with a hunter-killer missile, a lascannon and 2 heavy bolters sponsons, please let me know!